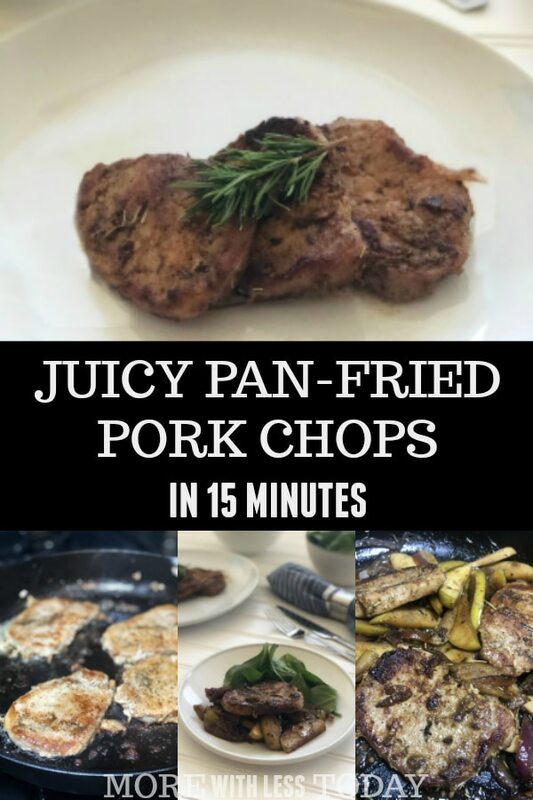 Easy Crispy Pan-Fried Pork Chops in 15 Minutes – No Breading Needed! This is an easy 15-minute meal. Put some pan-fried pork chops on the table for dinner tonight. 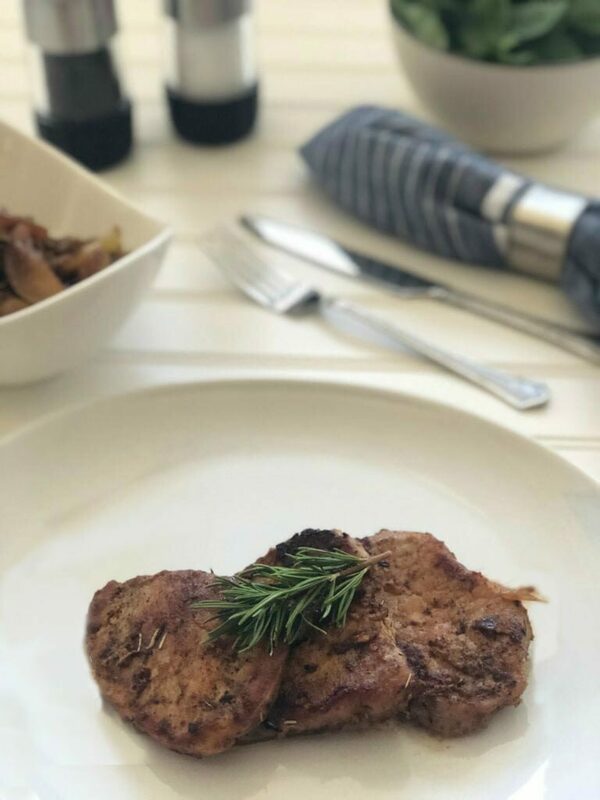 I’m about to share the easiest pan-fried pork chops recipe you’ll ever find. They are so juicy and flavorful, and no breading is needed. 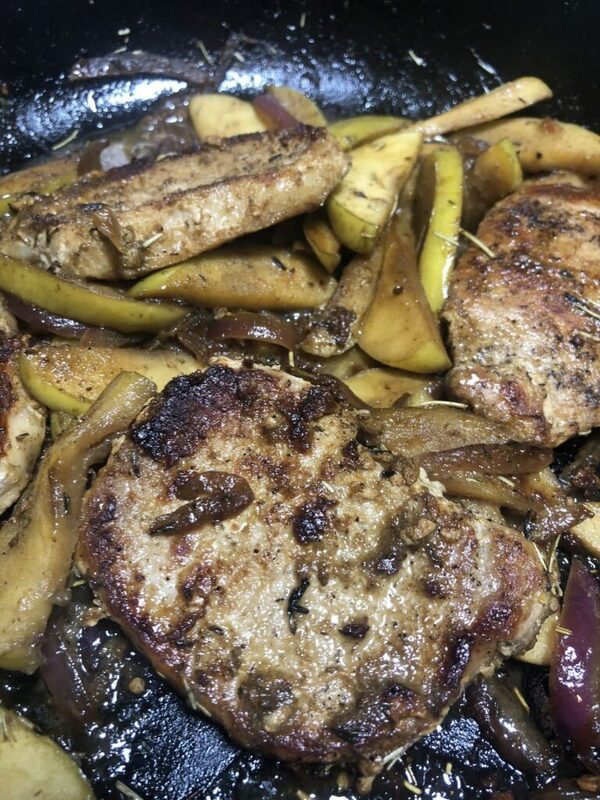 I’m an Omaha Steaks Ambassador and I was provided with the product for my recipe. All opinions are 100% my own. My favorite thing about frying pork chops on the stove is how they come out both crispy and juicy. Plus, this recipe has the best combination of herbs and spices with no breading needed. Definitely pin this recipe. You’ll be making it again and again. If you are an empty-nester like me, you can adjust the recipe to make just a few pork chops. Keep that list in mind! I like to take the herbs and rub them into the meat right before I cook them. As they sizzle, you can smell every single spice as it wafts through the air. This is the best part of cooking! Yes, there is an art to frying pork chops. How do you avoid burning pork chops on the stove? You want to use enough olive oil to coat the bottom of the pan. If you are cooking more than 2 pork chops, you might have to add more olive oil. Keep the temperature at low or medium-low. If the temperature is too hot, the oil will start to spit at you, and the pork won’t cook all the way through before the outside burns. You can tell the pork chops are done when the inner temperature is 145 degrees Fahrenheit. They will have a blush of pink in the middle. 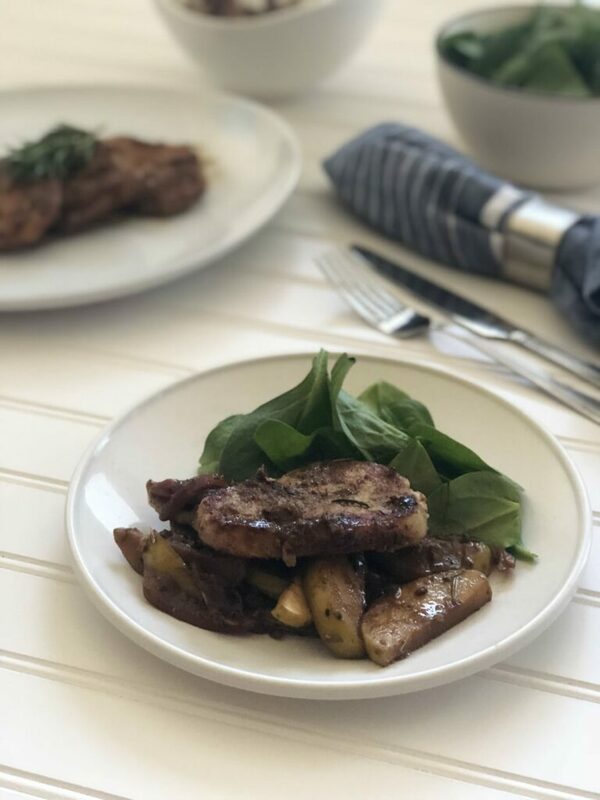 What is the best way to make pork chops? There are a few ways but I like stove top pork chops best. You can also grill pork chops, which is my second favorite way. I do really like the grill marks and incredible grilled flavor. 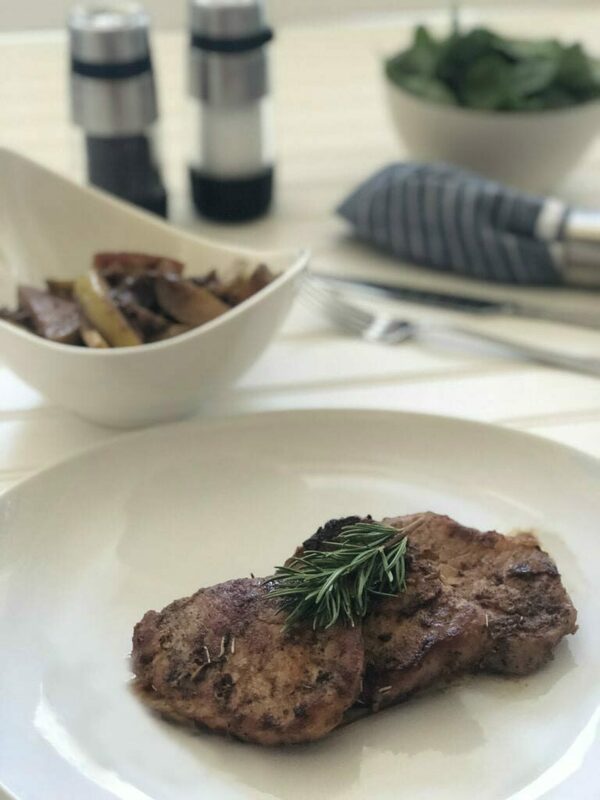 Now that you know how to season pork chops, let’s start making a batch of pan-fried pork chops! Here are some pictures that will take you step-by-step. I even included a picture of them plated. These have such a beautiful presentation at the end. 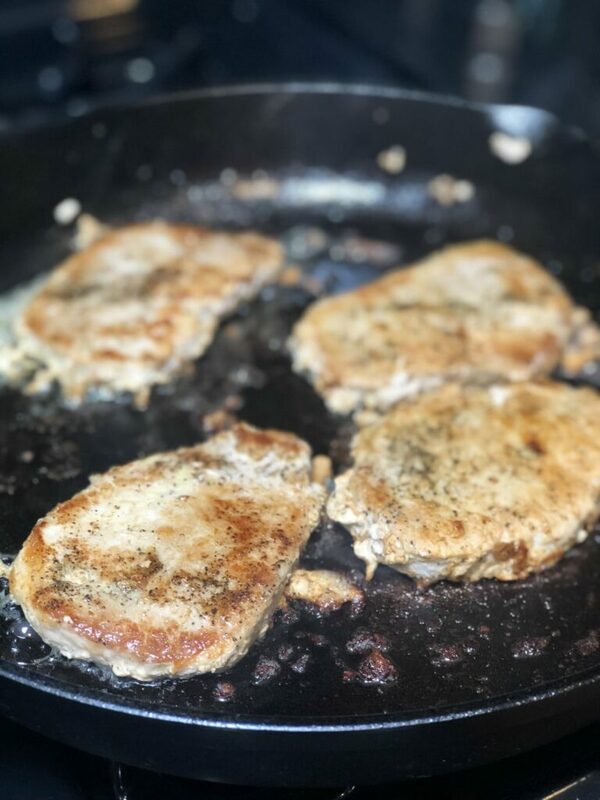 I used a cast iron skillet to make my pork chops. I love using my Cast Iron Skillet, you can’t beat the flavor. This is what they look like after browning on one side. See the crispy edges? Perfection! Then add in the apples and onions. After cooking them a bit, you’ll add the pork chops back in and pour the mustard, chicken broth, and honey, on everything. This is going to turn into an amazing caramelized sauce. Voila! A perfectly beautiful main dish! Here are two ways to serve the pork chops. You can either serve them alone on the plate, or you can place them on a bed of cooked apples. Don’t forget to pin this post so you can find it later. You’ll love this! Pork is one of my favorite meats to cook. Here are some more of my favorite recipes. Easy Pork Carnitas – You can make these in the slow cooker or Instant Pot. Copycat Zuppa Toscana Soup – The pork sausage adds some zest to this family favorite. Easy Dinners for $10 or Less – Lots of pork recipes on this list. Want to order some tasty pork chops and have them delivered right to your door? See the selections for pork chops and so much more from Omaha Steaks.